It is used to soak and render facades and architectural components in concrete, gasbeton, foamed concrete, brick walls, plasters in cement and lime, natural and artificial stone, tiles, covering stones, water repellent. IPAPHOB can be also applied on humid or wet supports without any problems and its combination of solvents and siloxanes with low molecular weight, confer it a high penetration ability. At the evaporation of the solvents, its active principles form a mesh that ensures an insoluble, transparent, nonsticky soaking, resistant to UV rays and dust. With IPAPHOB, it is possible to obtain a water-repellent effect without any changes of colour of the building material soaked; in addition, IPAPHOB does not compromise the ability of the treated material to diffuse water vapour. Prior to apply IPAPHOB, clean the supports with a light sand-blasting or vapour spray treatment, possibly adding detergents. The support may be wet, but not soaked of water. IPAPHOB is supplied ready for use and it must be only mixed accurately. 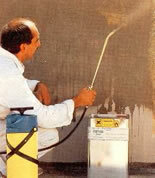 Apply two coats, through spray or a brush. The time between each coat must be maximum 3 hours. Consumption mainly depends on the absorption ability of the support; to calculate it exactly, we suggest doing a test on a sample surface. Glass and aluminium parts treated with electro-colour must be covered prior to start soaking with IPAHOB. Possible splashes on said surfaces must be immediately eliminated using a specific detergent. IPAPHOB reacts with air humidity therefore it must always be stored in properly closed containers. IPAPHOB is easily flammable, hazard class A1. Do not use it in presence of free flames. Avoid breathing the vapours, and ensure air circulation. Do not throw the product in sewers, work with gloves and safety glasses. Avoid contact of the product with the skin. To further protect your hands, apply a protection cream. Rinse possible splashes on the skin and in the eyes immediately using plenty of water, and consult a physician. The products are produced with the best raw materials found on the market to obtain a high quality product. Our warranty concerns the quality of the product and not the applications which are outside our control. The information contained in this sheet is based on our knowledge and experiences. In any case, it cannot be considered as guarantee, neither liability towards us, for the use of our products since the conditions of use are outside our control. Moreover, the Client must check that this sheet and the possible values contained in it are valid for the batch of product that he intends to use, and make sure they are not out-dated by following editions and/or new product formulas. In case of doubt, contact our Technical Office.